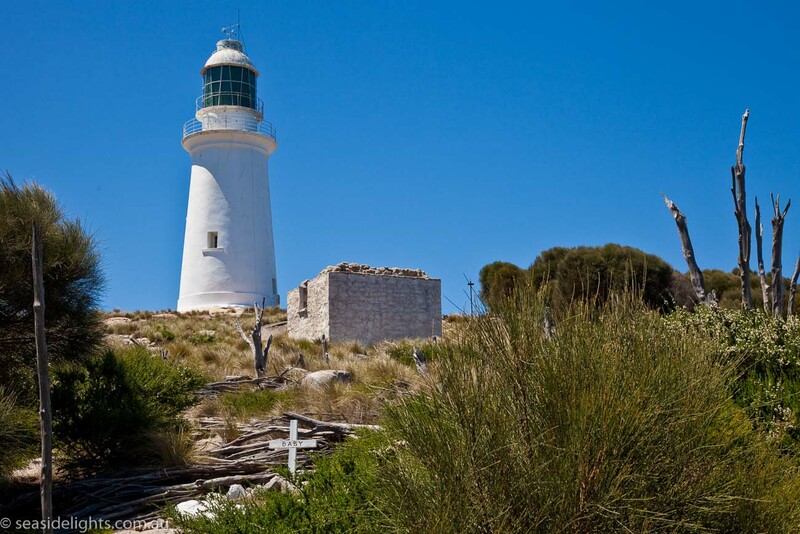 Deal Island Lighthouse | Lighthouses of Australia Inc. 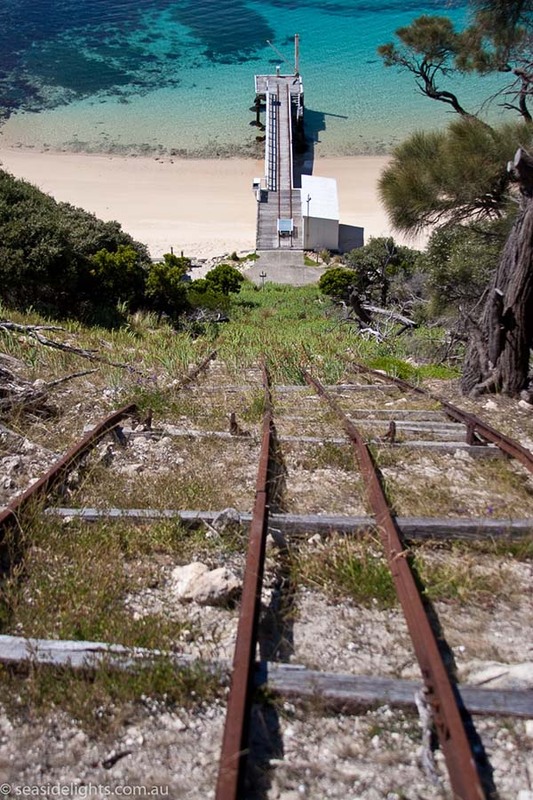 The Deal Island Lighthouse, Australia’s highest lighthouse at the elevation of 305 metres, unfortunately is starting to deteriorate as no maintenance has been carried out since it was abandoned in 1992. 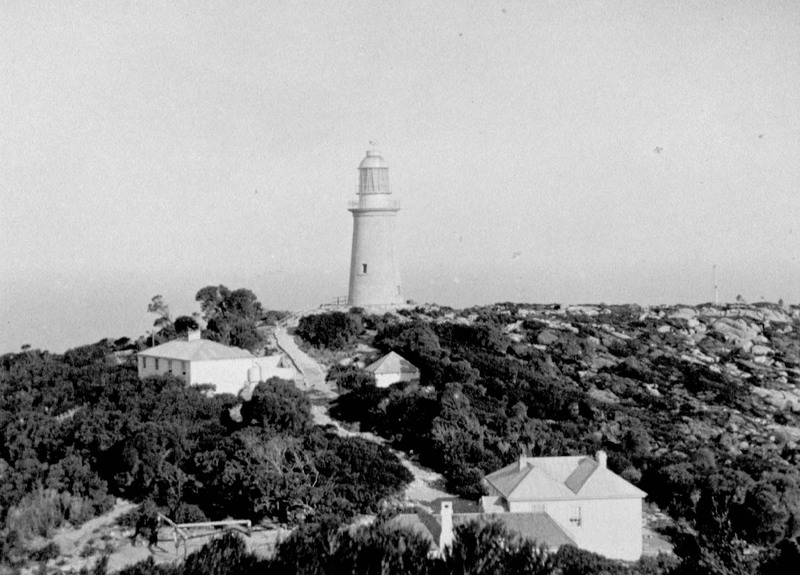 The Deal Island Lighthouse in Bass Strait was first turned on in 1848. It was built jointly by the New South Wales, Victorian and Tasmanian Governments. It is not only the highest light in Australia, but also in the Southern Hemisphere. 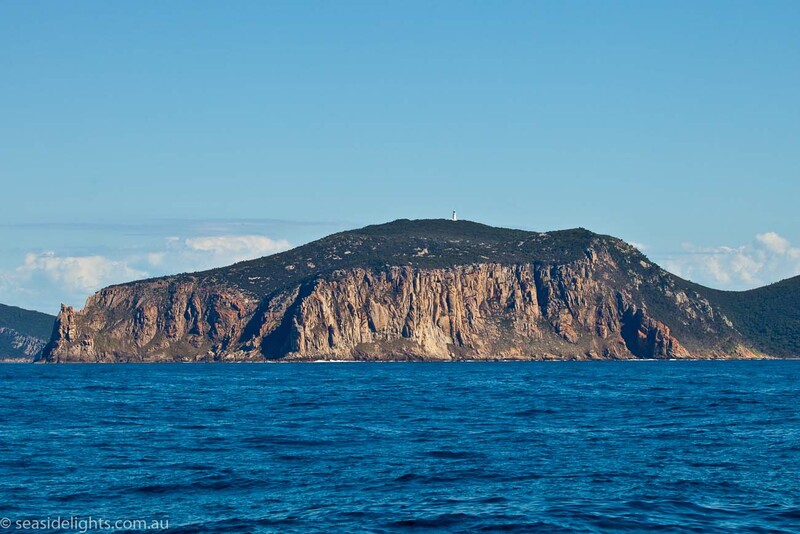 Some people consider this to be a Victorian Lighthouse rather than Tasmanian as adjustments in the border has placed the island in either state. The tower is constructed of rubble using local granite. Most other materials had to be brought to the island and hauled up lighthouse site 3 kilometres from the landing site and 280 metres above sea level. The list of materials included 5,000 bricks, 12,000 shingles, eighty rafters, 2,500 bushels of limestone, 200 joists of various lengths and great quantities of battens, boards, planks and other goods. Because of the location of the tower the project was quite labour intensive. The construction crew was made up of Charles Watson (officer in charge), an overseer, a medical dispenser, two carpenters, four masons, two quarrymen, one blacksmith, and nineteen labourers. Ten bullocks were also used on this project. 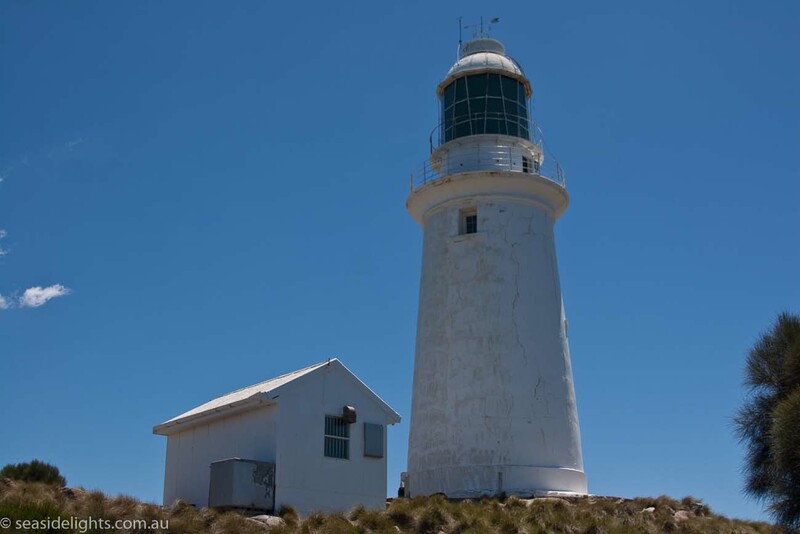 The high elevation of the light caused visibility problems with low cloud 40% of the time, however the keepers of the day at the Wilsons Promontory Lighthouse (75 kilometres to the north) reported seeing the Deal island light on an average of 6 nights in 10. The original revolving catoptric light apparatus was replaced by a fixed catadioptric lens having an acetylene operated flashing light source in 1921. This was further upgraded in 1937 with the installation of a first order revolving lens using a 1,000 watt electric lamp as the light source, taking power from an engine driven generating plant installed near the tower. 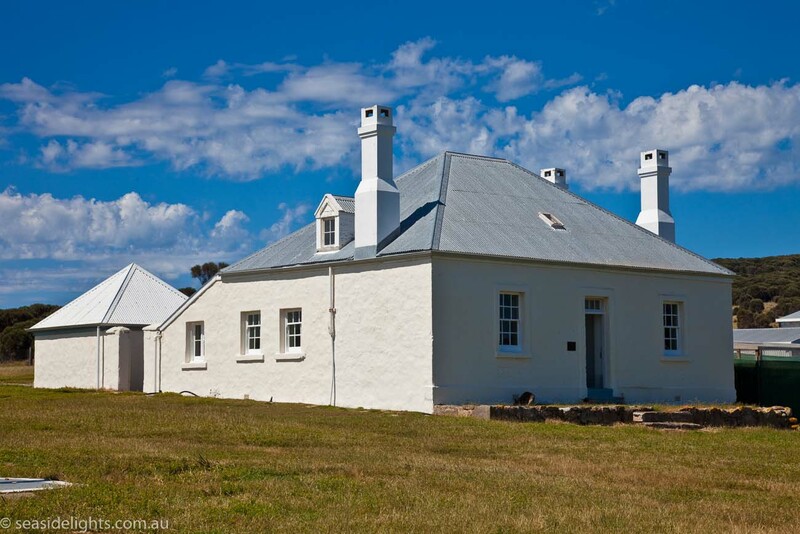 The original cottages were arranged with the headkeeper’s cottage being about 3 kilometres from the lighthouse and the assistant keepers’ cottages being adjacent to the tower. Later the assistant keeper was relocated to a cottages built halfway between the tower and the headkeeper’s cottage. This cottage has since been demolished and the original cottages are now ruins. Eventually new cottages were located within the old headkeeper’s compound, one being built in 1936 and two in the in 1960s. One of the sixties houses was demolished by AMSA in the 1980s. Originally stores and personnel had to be landed at the land-locked East Cove facing Murray Pass, the comparatively narrow passage between Deal and the other islands in the Kent Group. A series of horse driven whims and a bullock dray were used to haul the stores from the jetty up to the high ground above the cove and then the rest of the distance to the lighthouse. Later a four wheel drive vehicle was used to bring up the stores, then helicopters from the 1980s until the lights closure. Until 1926, when a wireless telephone was installed, the only way of communicating with the outside world was by flagging down a passing ship. Apart from normal duties, the lightkeepers had other situations to contend with. There have been major bush fires on Deal in 1919, 1950, 1986 and the last being in 1995. The assistant keepers cottage was burnt out in the 1919 fire and another abandoned cottage was destroyed in the 1950 fire. 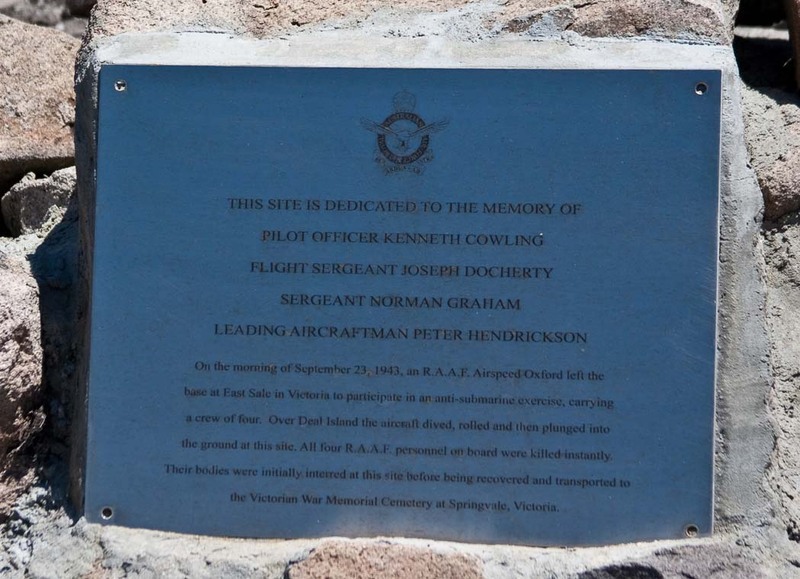 There was also an RAAF air crash on the Island during World War II when four lives were lost. A few years earlier (prior to deactivation) some “tupperware” lights were put on nearby North East and South West islands to supplement the Deal Light AMSA stated at the time, not to replace it. However, the light on Deal Island was turned off for the last time on 2 March 1992. The station was then destaffed in July 1992 using helicopters and the ship “Flinders Trader”. An entry in the log book at the Museum on the island shows Max and Linda Lucus leaving the island on the Flinders Trader in July 1992. It is likely however some casual AMSA employees remained on the island for a few months July. In 1992, AMSA appointed a volunteer caretaker. He remained on the island until 1998 when the state of Tasmania demanded vacant possession of the island on transfer of ownership from AMSA. In 1998, the Tasmanian Government contracted the Australian Bush Heritage Fund to provide a caretaker for Deal Island. In 2000, the Tasmanian Parks & Wildlife Service took over direct management of the volunteer caretaker scheme. 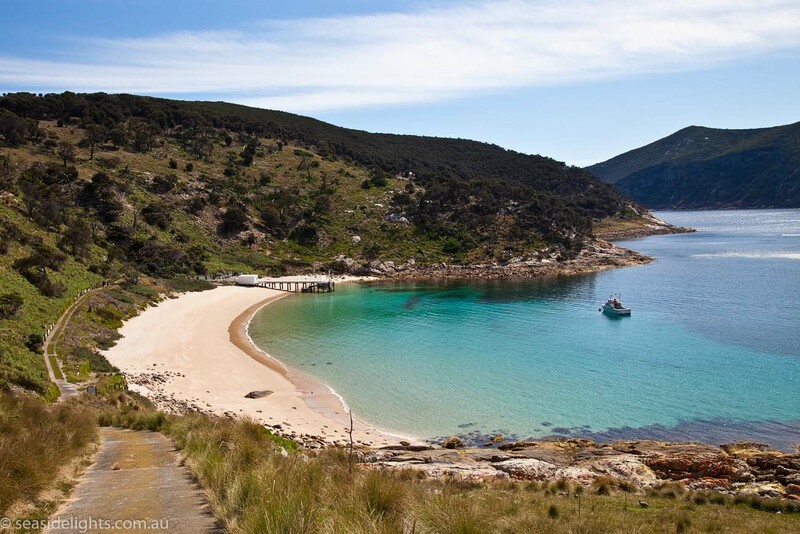 Since 1998, the Tasmanian Conservation Trust, the Marine Coastal Community Network, Friends of the Kent Group National Park (Wildcare) have contributed significantly to the management of both the cultural and natural estate of the island. 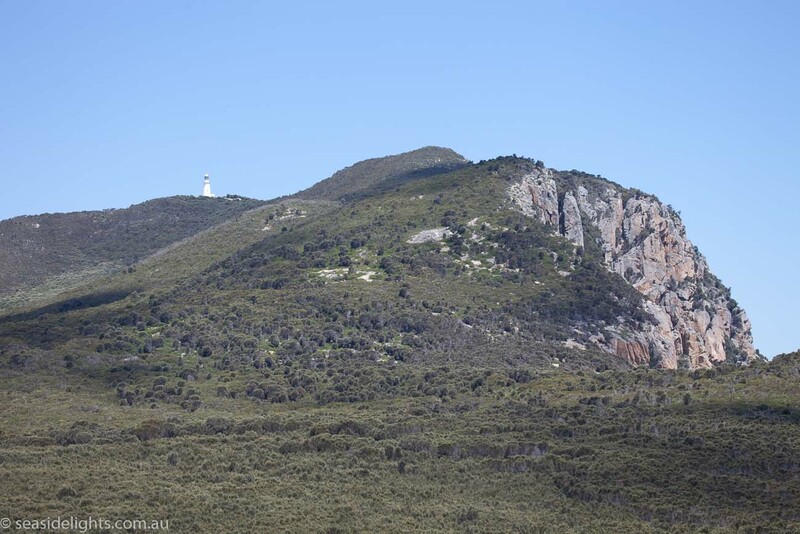 The five years since the transfer of ownership from AMSA to the government of Tasmania has seen considerable efforts by community groups, the caretakers and the Tasmanian Parks & Wildlife Service to maintain the old lightstation. It is looking much smarter and is starting to resemble the condition it was maintained in when it was an operational lightstation. However to keep it in reasonable shape it will continue to require many additional volunteer hours in the future. When AMSA left the Island the tower was simply locked up. 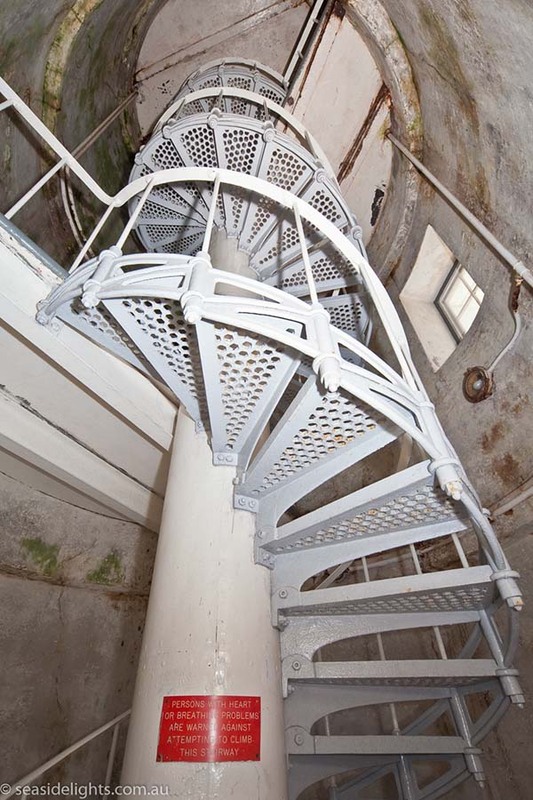 Reports soon after by visitors to the island who have been able to access the lighthouse have reported that the interior is deteriorating rapidly as all ventilation vents have been closed leaving the condensation on the interior to attack the stairs and apparatus. If you wish to be involved in the management of Deal contact Christian Bell at the Friends of the Kent Group National Park. There are four marked graves on the island. We need your help in compiling a list of keepers for this lighthouse. If you have any information then send it to Web Keeper. The lighthouse grounds are open all year round. 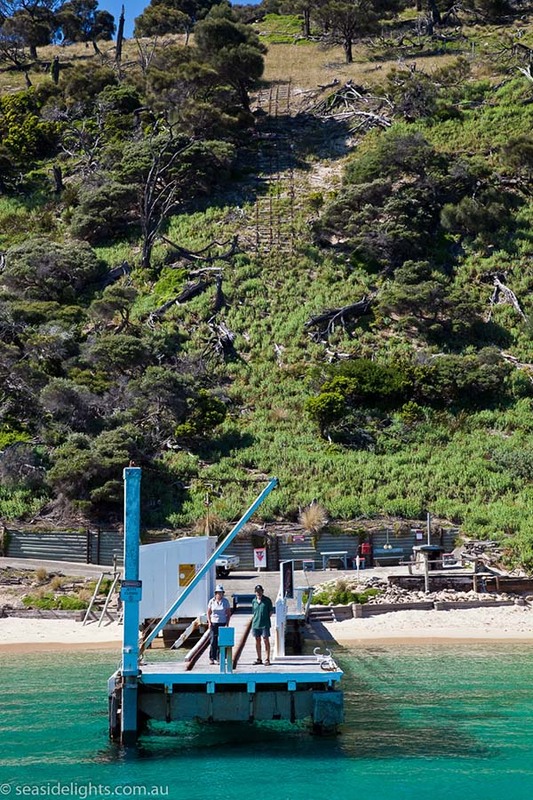 Access the island by boat from Flinders Island. Tours of the lighthouse may be organised with the Island’s caretakers. The oldest cottage houses a small museum..
Friends of Deal Island Wildcare Inc.